In a high-tech world, it is difficult, especially for parents, to keep their kids away from harmful displays. This process is made even more challenging since toys are also evolving and trying to keep up with the technological environment. Luckily, there is one that stands out from the crowd as a toy that even though simple, it still offers many functions and can improve your child’s development. I am talking about kids rocking horse. Read on for further information about all the benefits this appealing toy offers. 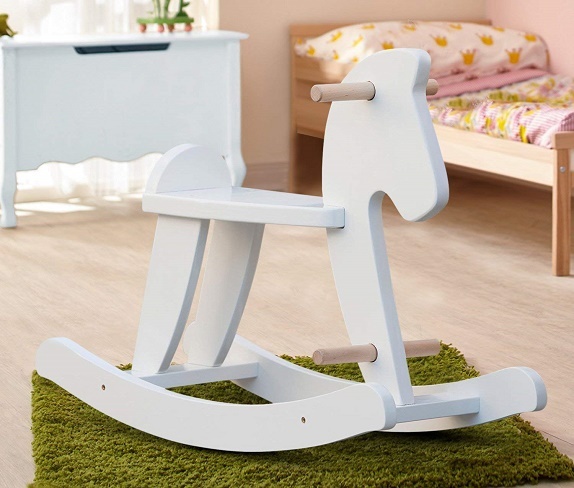 First things first, when deciding whether a rocking horse is the best option for your child, you should also inform yourself about the material these come in. For optimal results, it is best to consider getting a wooden rocking horse. The plastic counterparts are made of toxic chemicals, whereas a wooden kids rocking horse is a toy made of natural materials that can keep your child safe and healthy. Since wood is sturdy, this type of toys require almost no upkeep, and can certainly withstand even tougher and more energetic use. Rocking horses have timeless appeal and have made many children happy since the day of their invention. 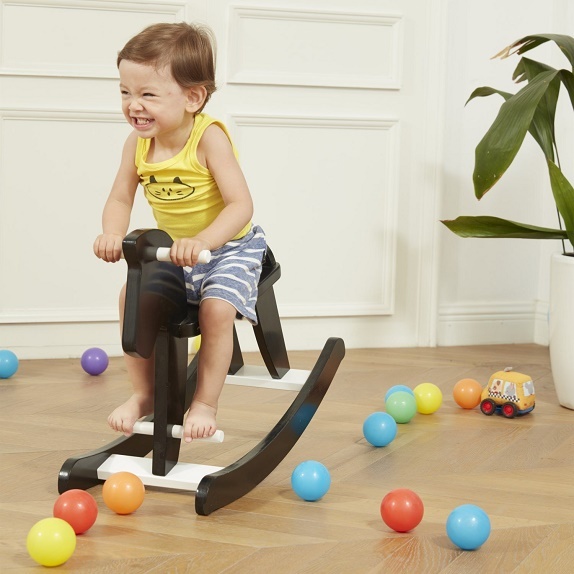 The main goal of wooden kids rocking horse is to improve your children’s mobility and balance. While playing, children need to use leg and core muscles to make backward and forward movements. Without these, the toy would remain still, and that is no fun. So, your children will instinctively look for a more fun way to use it and will start to push it back and forth, thus making their muscles stronger and more flexible. In a similar manner, while on the rocking horse, your children will be subconsciously and easily learning how to balance too. Rocking movements stimulate the vestibular (inner ear) system, which encourages children’s growing sense of balance. This skill comes in handy especially when they are trying to walk and run. On the plus side, through repetitive movement and constant holding onto handles, kids develop fine motor skills, improve their hand and finger flexibility, and the whole moving back and forth process teaches coordination between hands, arms, legs and feet. Lastly, the process of finding the right toys is especially overwhelming if you have children with special needs. Besides all the benefits mentioned before, your children will need a way to help them deal with overstimulation or stress. These children cope with a large number of difficulties every day and are in greater need of toys that can offer them effective coping strategies. For instance, rocking horses can be beneficial for autistic children who sometimes tend to rock back and forth. Additionally, rocking is a natural calming activity and can soothe even more agitated children.